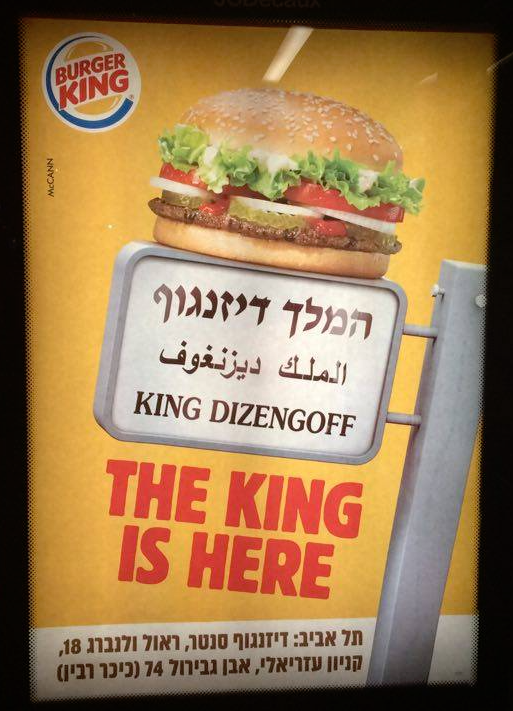 Tel Aviv/Dizengoff: Tel Aviv, a city that lost its damn mind this year after the opening of a Burger King, has declared itself a World Cultural City. Burger King’s arrival (return) in Tel Aviv caused the entire city to stop what they were doing and wait in line for 3 hours in order to experience hamburgers slightly better than McDonald’s, fries somewhat worse than McDonald’s, and genuinely awesome onion rings. The Daily Freier spoke with Tel Aviv’s Cultural Affairs Spokesperson Safir H. in order to truly understand the city’s new international status. “From our Bauhaus Architecture to our renowned theater to our amazing cafe society, we as Tel Avivians must embrace our status as a World Cultural Center.” explained Safir as she munched on a BK Original Chicken Sandwich (“Long Chicken” here in Israel!). The Daily Freier then asked Safir what it is about Tel Aviv that distinguishes it from other cities of the World. “We are a confluence of cultures. European, Middle Eastern, North African, Latin American. There are just so many influences to our daily lives here.” explained Safir as she added ketchup to her onion rings while sipping her BK Cafe Americano (Only 4 Shekels!). “There is just something about our Urban enclaves such as Sarona or Neve Tzedek that you don’t see in other cities. This mix of urban street life and quiet reflection.” explained Safir as she started to attack her vanilla soft ice cream. As the Daily Freier got up to leave, Safir asked us if we were going to finish our Whopper. C’mon guys, Burger King chips are awesome. Only thing missing is the bacon.